It has never been a secret that constant upgrading of software is as needed as water in a desert. Current shopping carts are not exception, they are developing so fast that you always need to keep abreast of the innovations if you are aimed to meet the highest market demands. What is this all about? Recently, one of most robust and worldwide used platforms made a long-awaited release, and now the community is wondering whether it is worth to upgrade OpenCart to the latest version. This is the reason why we have decided to make a review of OpenCart 3.0 features and provide you with upgrade guide to keep up with eCommerce trends. Let’s go deeper into details and find out why these openCart 3.0 features are named to be crucial. Adding Marketplace as extension into Admin Panel is an applausive step. Before release of OpenCart 3.0 it was reachable only via official website - now you’re able to purchase and install any addons directly from Admin, even if you don’t posses tech skills. In the Marketplace you can search for language packs, plugins and whatever you need to improve your store. There are many new filters added to standard search function in Marketplace. They make your inquiries more specific. We have to admit that finding and downloading modules in OpenCart now is now much simpler and faster. 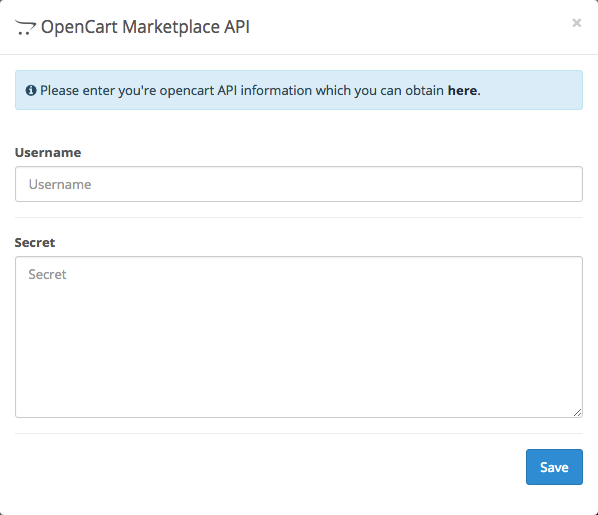 To start purchasing from the new OpenCart Marketplace, you need to provide your API and profile details. Another important extension added to Admin is Language Translation. It allows store owners to run business on their native language by simply installing and uninstalling it from Available Translation provided by Crowdin Project. This is a very progressive feature for entrepreneurs that want to showcase the content in native language. Such a simple language management is another argument to upgrade OpenCart to 3.0 sooner or later. The brand new thing introduced to OpenCart users is the improved Theme Editor. Now you can modify platform’s themes directly from Admin via Twig language. Theme editor is user-friendly - you select the template and edit its code whatever you want. It allows you to modify 3 main elements - themes, pages and the code of the pages in particular. Moreover, if you are running Multistore, you can change templates of each store and customize it how much you need. And there is no need for FTP access to make these small edits in OpenCart 3.0. Thanks to it, working with this eCommerce solution becomes faster and simpler. With the improved Theme Editor you’re able to customize your storefront and improve the general look from a single Admin. New OpenCart 3.0 Language Editor allows you to change and customize any text in your store content to a preferable language without troublesome installation of additional translation extensions. Now everything is available out-of-the box. How that sounds? To translate the content choose the language you want and fill in the text in the Value field. What is so special about OpenCart 3.0? The brand new interface design. It’s more clear, compact and minimalistic - the platform is no doubts following the latest eCommerce trends. Design improvements can be noticed thought the whole Admin Panel - added user’s icon in profile menu, category menu hamburger and many other minor changes. New chapter in OpenCart life story starts from new look! 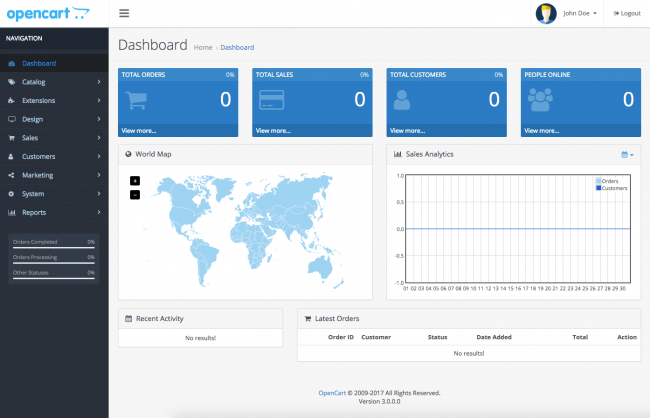 Along with major improvements, developers of OpenCart 3.0 prepared much more to show off. Let’s talk about other new functionality presented in the latest release. The great thing worth mentioning is that from this moment OpenCart 3.0 support Multilingual SEO URLs. This feature enables you to use any language you wish to appear in Google SERP. Note: SEO keyword is now situated in the new SEO tab in the Category editing field. We were talking about adding of Marketplace extension, but it’s not the only improvement in this section. Many new filters are added in the whole Admin Panel. The one more addition we want the mention in our OpenCart 3.0 features review is the new improved Extension Installer. It received the new section called Install History, that records all the extensions that you have already installed. Developer took care of sorting the data you want to receive about your store performance. Now you can choose what kind of report you need and disable the others. And again, managing reports is easy as piece of cake - go to Extension and pick up Record from a dropdown list and install the types you want to track. Finally, the last important new feature that can’t be neglected in our OpenCart 3 review is the new Statistics menu that gives you a possibility to track complete and processing orders, out of stock products, returns, pending reviews etc. In order to update the value - click Refresh button on the right sight of each line. Nobody would deny that all of applied improvements and new features of Opencart 3.0 make this platform even more robust and optimized than it has been before. Of course, OpenCart is among leading shopping carts and it has always been famous for being both flexible and use-friendly. But new OpenCart 3.0 features show that upgrading to the latest version is what you need to be on top. It may be a hassle to update OpenCart every time a new version comes out, but the rewards are greater too, believe me. How to upgrade OpenCart to the latest version? Upgrading open-source platform has never been an easy thing. With OpenCart it also seems confusing and troublesome and if you’re not tech-savvy you may face difficulties e.g. losing some data or errors during the updating process. The more reliable way is to call for developer’s help - that will definitely save you from code manipulations, but the cost will make you to tighten your belt firmly. We can offer you a cheaper alternative, interested? To facilitate the life of store owners and make upgrading process more enjoyable than irritating process, we designed a handy tool called Cart2Cart that can automatically upgrade OpenCart to the latest version with no user interaction. If you’re still here we are going to provide you with detailed instruction, explaining how to upgrade your OpenCart to 3.0 step by step. To dispel your doubts, let us give you a brief CV of Cart2Cart. This service is the easiest possible way, offered by current eCommerce market to upgrade your shopping cart or migrate to other desirable solution (check the list of more than 80 platforms). It has more than 45 000 successful switches on its count and offers the largest list of transferable entities. What makes upgrading with Cart2Cart comprehensible and fast is that it doesn’t require any tech skills and the whole data transfer process is accompanied by MIgration Wizard to make it even more easier. There is a 24/7 support always ready to help you if any migration-related question occur. And finally, you are welcome to check the quality of data migration and testify the service by performing a Free Demo OpenCart upgrade. During test data transfer a limited number of entities will be moved from your current Opencart store to a new live OpenCart within 30 minutes. Important: In the further instructions we will use the term “migration” instead “upgrade” due to the basic principle the service works on - your data is actually migration from old Opencart version to a new established store. Now, we are ready to start, keep following the guide carefully to get the successful result. 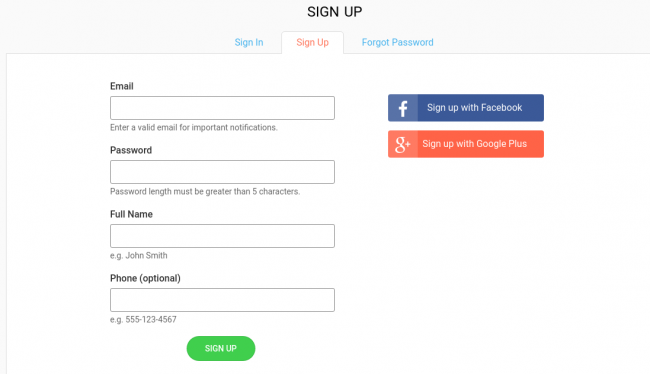 Sign up with your Facebook or Google+ account or create new Cart2Cart account with your valid existing email. After finishing with registration, click “Start Demo migration” to start automated migration by yourself or “Get migration package” to delegate OpenCart upgrade to Cart2Cart technicians. We are going to show your how to Upgrade OpenCart to the latest version by yourself. Pick up OpenCart as a Source Cart and provide your store URL. After, Download the Connection Bridge ( so called “gateway” to access your current store’s data), unzip it and upload it to your current OpenCart root folder. Pick up new Opencart as a Target cart and provide your store’s URL. Then, do the same action as with your Source Cart. Download the Connection Bridge, unzip it and upload it to your new OpenCart 3.x root folder. Optionally, you are able to perform Demo data migration to a Cart2Cart Test store instead of migrating data to your new OpenCart. 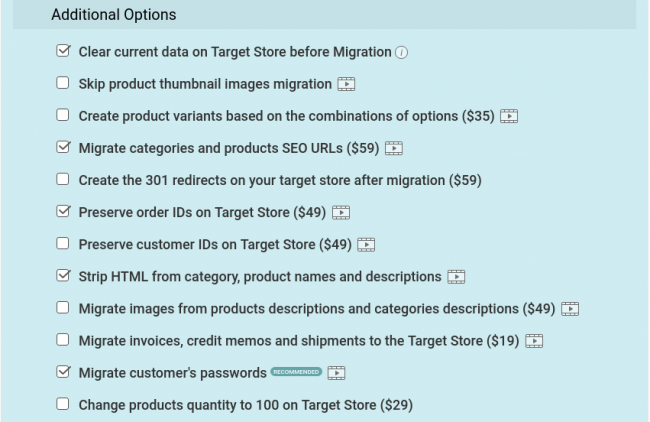 If you decide so - tick the check mark on “Try migration using Cart2Cart test store” (above field “Target Cart”) and you can proceed with your upgrade. Test stores are provided for free, they are safe and exist 7 days after the migration. 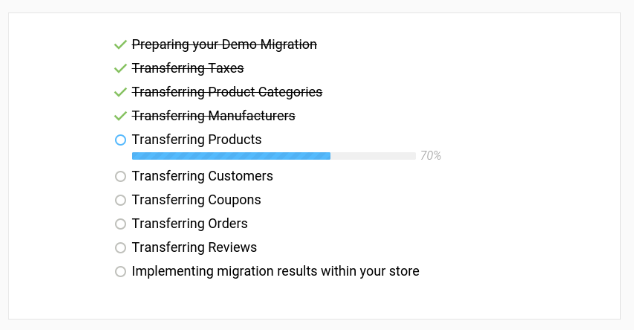 Now it’s time to select entities you want yo be transferred to your new OpenCart store. You are able to choose particular data or click “Select all” to continue. 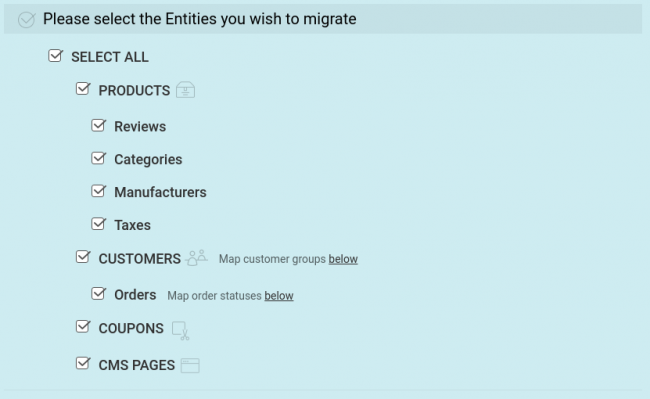 After choosing entities you want to be moved during OpenCart upgrade, you are offered to pick up some additional migration options to extend your data transfer possibilities more. Additional options are available for extra price and for each of them there is a detailed description and video in the end of lines that explains thoroughly how particular option works. After selecting entities and additional options you can start Free Demo migration by simply clicking “Start Free Demo” button. During Demo migration you will see the progress bar with the process of data transfer. Test transfer will last no longer than 30 minutes . After it’ll be finished you will get the notification email, so there is no need to sit and wait, you can close the window and come back to your deals. After evaluating Demo results and checking the quality and speed of data transfer with Cart2Cart, you can start the actual OpenCart upgrade to the latest version by clicking “Start migration” button. The same as with test transfer you can come back to your life and continue selling, Cart2Cart will take care of the rest. Note: Cart2cart will not affect your current store performance, it will remain fully active. After the process of OpenCart upgrade will be over, you’ll receive the notification email and invitation to check the results. That’s all. Enjoy your OpenCart 3.0 features! We hope that this guide is useful to you and soon you’ll be a lucky OpenCart 3.0 store owner! There are no reasons to undertake such a possibility to boost your store performance and enrich your platform with new functionality. If you are ready to upgrade OpenCart to the latest version right now, don’t waste a minute - start a Free Demo and meet your new store in few hours!